How Much Should You Budget For Marketing In 2018? by Chris Leone This article by Chris Leone, from WebStrategies has been reposted with permission. As President, Chris is responsible for leading all the day-to-day operations of WebStrategies. His work has been featured on the Google Analytics and Hubspot blogs, and he’s a regular columnist for the Richmond Times Dispatch. other leading digital marketing research firms. 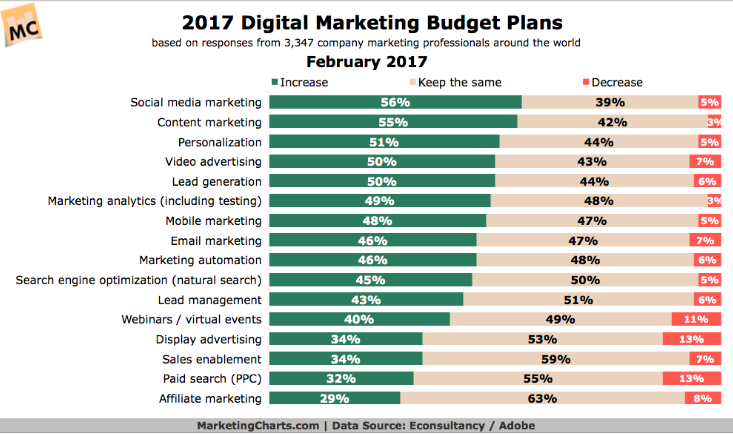 With no evidence to suggest this trend will change, 2018 marketing budgets are expected to remain consistent with 2017 levels or increase. 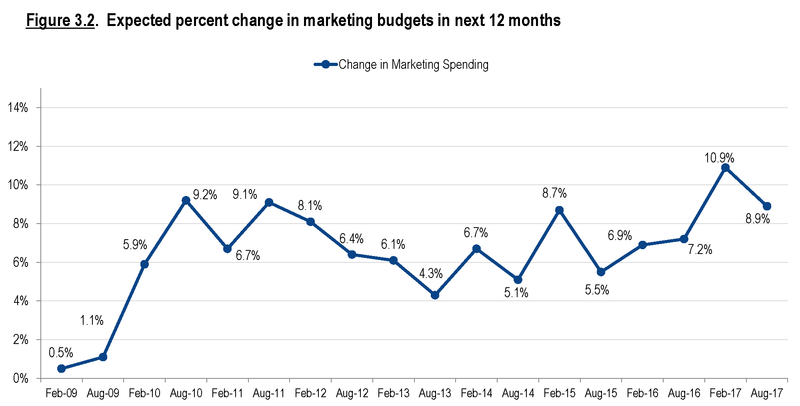 The report above from cmosurvey.org shows a slight slow-down in the rate of increase in marketing spend after a large jump in early 2017. 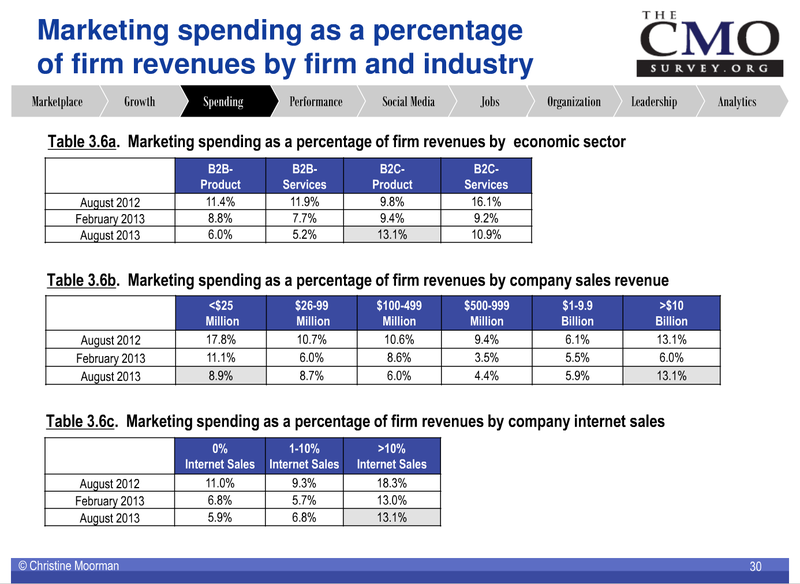 The largest increase in projected marketing spend occurred shortly after the recession of the late 2000’s, but continues to fluctuate between 4 and 10%. 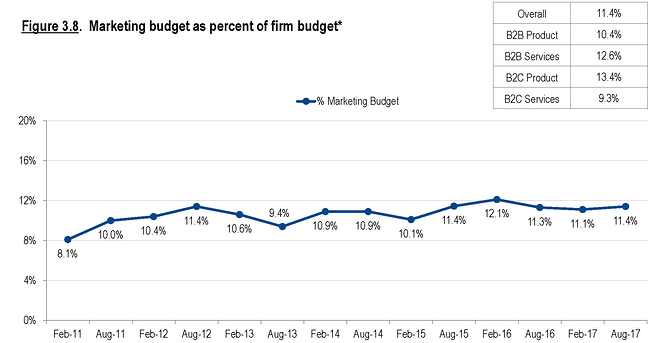 Marketing budgets as a percent of the overall firm budget has remained even more consistent, as shown in the chart below. 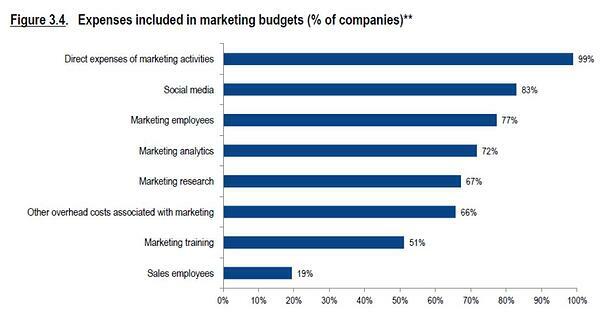 On average, marketing budgets make up 11.4% of total company budgets, with some variation depending on the industry and who they're marketing to. 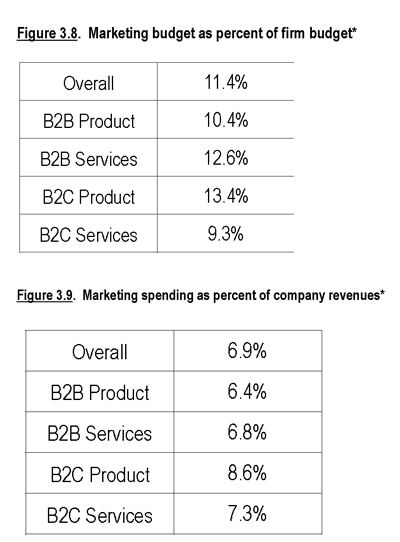 Not surprisingly, those companies in the B2C product space allocate the largest portion of their total budget to marketing, averaging 13.4%. 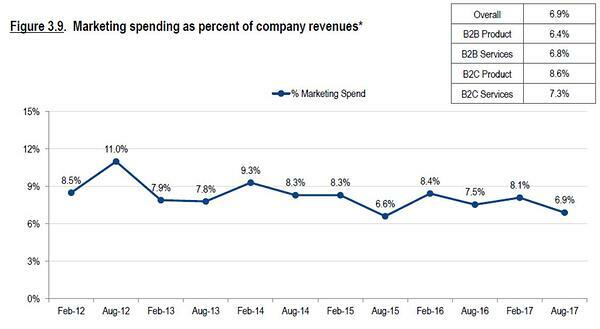 Marketing spending as a percentage of revenue tends to fluctuate, but has trended down slightly in the past few years, with the highest percentage again coming from B2C product companies followed by B2C services. Online video will represent the highest growth category, with the anticipated investment more than doubling 2016 numbers by 2021. 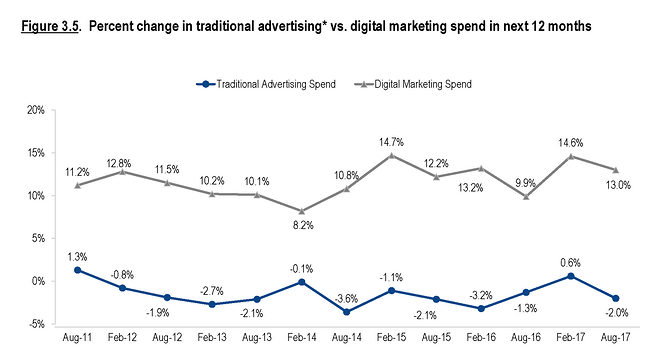 The chart below shows strong increases in digital channel investment. At least half of all respondents planned to increase spending on social media marketing, content marketing, personalization, video advertising, and online lead generation. 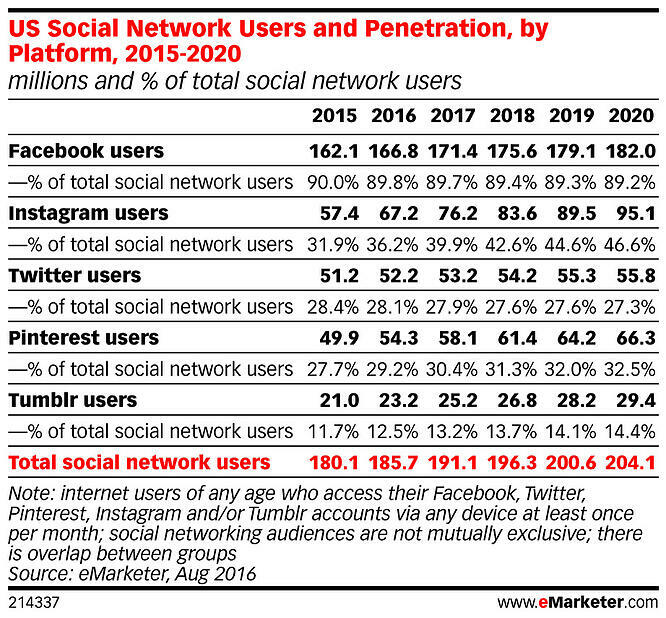 An August 2016 report from eMarketer attempts to project social media penetration by social platform through 2020. Facebook is expected to remain king, with 90% of social media users utilizing the platform. Instagram is expected to grow, from 32% penetration to 47% by 2020. In a 2017 report from Hanapin Marketing, 75% of respondents expect to increase their Google Adwords investments in the next 12 months (more than any other digital channel). Facebook, which has become a respectable competitor to paid search, expects to see increased investments by 71% of respondents. Instagram and Twitter, by comparison, expect to see increased investments from less than half of respondents (46% and 21% respectfully). Snapchat, which has a greener ad platform, was at the bottom of the list, with only 15% of respondents expecting to increase investments into 2018. This marks the first time in history digital spend surpassed TV ad spend in the US. And the gap will only widen—by 2020, digital spend will surpass television by 36%. 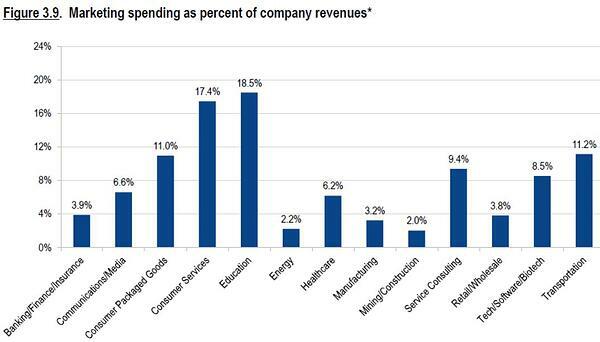 Digital spend is only a portion of total marketing spend for most businesses. 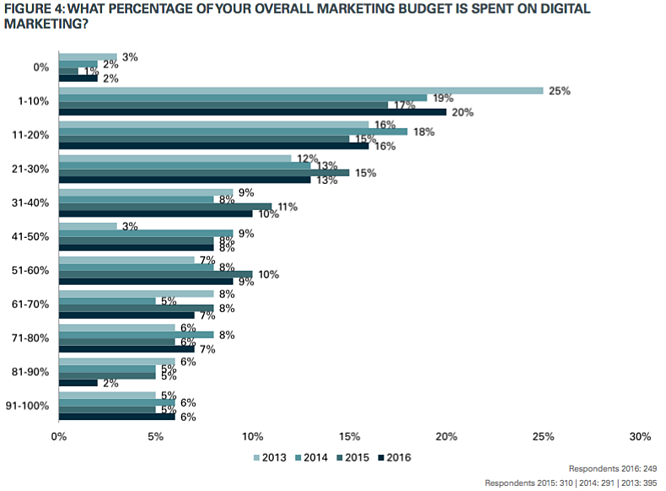 For 50% of businesses surveyed, digital represents less than 40% of total marketing spend. Businesses who rely more heavily on the internet to generate sales (e.g. an ecommerce business), invest a greater percentage of their marketing budget towards digital. 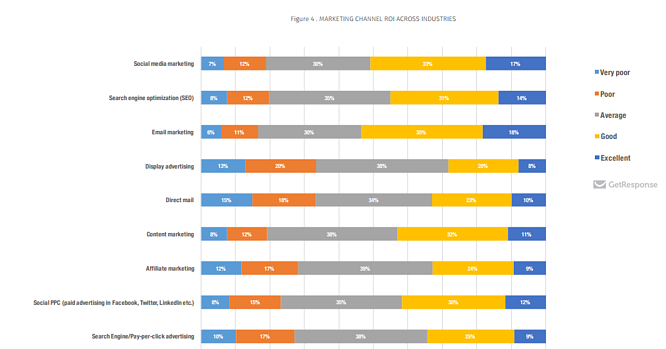 The CMO survey offers some answers. In the charts below you’ll see how marketing professionals from all types of firms responded to this question in 2017.